Orangutans -- who live high in the treetops of Borneo and Sumatra -- have the longest childhoods of any animal. Primatologists believe this is due to the immense amount they have to learn to survive in the rain forest. They must learn to eat, to sleep and to protect themselves within their environment. This education and nurturing comes only from their mothers, as fathers wander off after mating and don't return. Orangutan infants cling to their mothers for the first one to two years of life, traveling as one through the trees and sleeping in the same nests. Some mothers and babies hold hands after age 2, which is called buddy travel. Other mothers continue to carry their young until they are 5 years old. They typically breastfeed until age 8, when they reach puberty. They continue to stay close by their mothers until age 10 or so, traveling and sleeping in the same trees and eating together. Orangutans' food comes from the trees -- bark, leaves, flowers, insects and more than 300 kinds of fruit. Mothers show their young in which trees to find food in different seasons, and how to eat it. Some fruits and seeds have to be extracted from pods, which may be covered in sharp spines or encased in shells that must be cracked open. Young orangutans learn to use the tools, such as branches to dislodge fruit and forage for insects, and to chew the leaves for water when rain is scarce. They help find the large, leafy branches that shield them from sun and rain, and build high nests from leaves and branches. Customs also are handed down from mother orangutans to her young. Orangutans in Borneo, for example, learn to use handfuls of leaves as napkins to wipe their chins. Sumatran orangutans learn to put large amounts of leaves together as cushions to sit on, and as protection for their hands when holding spiny or rough pods. Around the age of 10, orangutans start to become independent. While they still stay near their mothers, they start to associate with orangutans of their own age. Now capable of finding their own food and making their own nests, they still do so in the general vicinity of their mothers, traveling in the same general areas. Soon, however, the males go off on their own, while the females continue to stay nearby. In this way, females learn how to care for and nurture babies by watching their mothers with a younger sibling. Female orangutans become sexually active around age 12. At this point, they tend to travel with other female adolescents, though they still come back to "visit" their mothers until age 15 or 16. 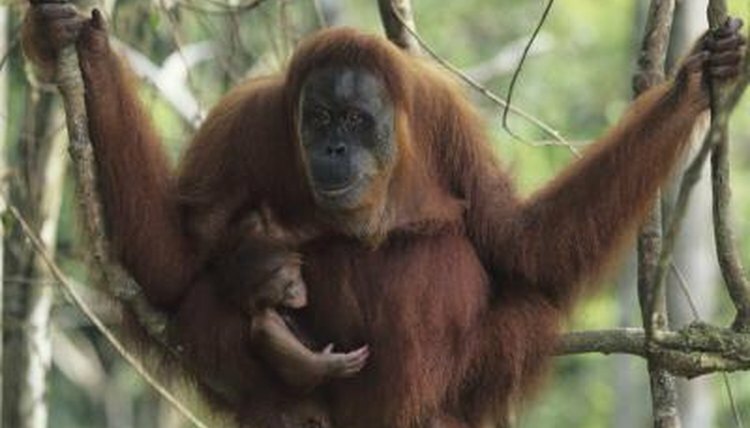 About the same age, a young orangutan may have her first baby. Only one baby is born at a time, typically about eight years apart. A female orangutan typically bears three or four babies in her lifetime.